At 55, Susan Doremus is happy to be alive and enjoying time with her two grown children and 7-year-old granddaughter. Susan’s battle with cardiovascular disease has only made her stronger! Living life to the fullest has become her mantra. According to the American Heart Association (AHA), heart disease is the No. 1 killer of women, claiming the lives of more women than all forms of cancer combined. This year, one out of every three women will die from some form of heart disease. The AHA wants to empower women – through the Go Red for Women campaign – to beat heart disease and stroke. The good news is 80% of cardiac deaths can be prevented. 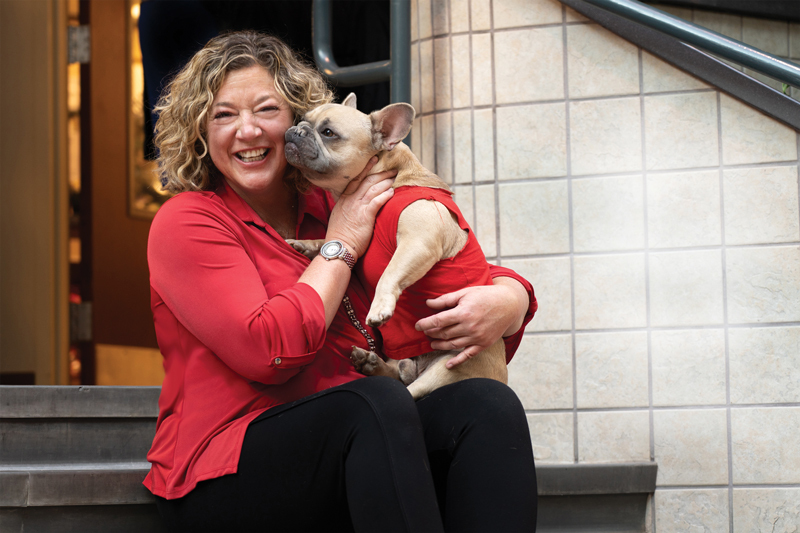 Susan Doremus and Frank, her niece’s French Bulldog, will be wearing red on February 1. Frank visits campus to take part in the Pet a Pooch program that is held to help students deal with stress during finals. Thanks to women like Susan Doremus, who are speaking out about their experiences with heart disease, women are becoming more proactive about their heart health. To look at Susan today, you would never guess that her health had been challenged. She is a very vibrant, active and happy woman. Her laughter is totally contagious. As the director of The College Store at Elizabethtown College, she has done a stellar job of transforming the store and keeping it in step with the latest trends. Susan’s story began in 1991 with a chronic cough and pain in her back. Doctors suspected her symptoms were due to bronchitis. After having a chest X-ray done to rule out pneumonia, it was discovered she had a tumor. “It was the size of a cantaloupe and was wrapped around my heart and lung,” she explains. After a very intricate, invasive biopsy was performed, Susan was diagnosed with Hodgkin’s lymphoma. What followed was a year of radiation and chemotherapy combined with the support of family and friends and a mountain of faith, all of which carried her through a very difficult time in her life. Today, some 27 years later, Susan is cancer free. It was during the cancer treatment when Susan was looking at the results of one of her CAT scans that she remembers reading in part, “advanced signs of atherosclerosis.” She remembers thinking to herself, “What is this?” Her physician at the time was more concerned about getting her through the cancer and assured her not to worry about the atherosclerosis (a thickening or hardening of the arteries). So, she put it out of her mind for the time being. Ten years later, Susan began experiencing flashing lights and floaters in her eyes (classic signs of a possible, impending stroke). After the proper testing, she underwent a carotid endarterectomy, a surgical procedure to remove plaque from a carotid artery in her neck, which was 95% blocked. Through research, Susan discovered that atherosclerosis could be caused by several factors: high blood pressure, physical inactivity, smoking and/or high cholesterol. In Susan’s case, her atherosclerosis was due to high cholesterol, which she apparently inherited. It’s called “familial hypercholesterolemia” or high cholesterol that runs in families. It also didn’t help matters that she had smoked for a short period in her life. Two years following the carotid endarterectomy, she noticed a throbbing in her neck while walking to her car. After a cardiac catheterization was done, emergency double-bypass, open-heart surgery was performed. Today, Susan has her health under control. She carefully monitors her health, takes her meds as prescribed and listens to her doctors’ advice. “You should always listen to what your body is telling you,” she says. Following her own advice, whenever she notices anything unusual with her health, no matter how subtle, she sees her doctor. “A positive attitude is important, also,” she adds. She was part of a therapy study to reduce a person’s risk for either heart attack or stroke. The injection has become an approved treatment to reduce cholesterol. She has been on it for three years and so far, she is doing well. Susan is adamant that if you suspect a heart attack or stroke, you should immediately dial 911 for an ambulance. She dismisses the notion that some people might feel they are overreacting if their fears do not turn out to be a real medical emergency. Susan advises you to put those fears to rest. “Go to the hospital. Get it checked out,” she says. She is a case in point. Today, Susan enjoys spending time with her family. She takes time for interests such as horseback riding and traveling. And, she has loved working at Elizabethtown College for the past 23 years. “That is a long time for me to stick with anything, but it’s been a great job and I love it here,” she says. This year, Friday, February 1, will be observed as Go Red for Women Day. On this day, women are encouraged to wear red as a way to create awareness for women’s heart health. In 2004, the AHA introduced its “comprehensive platform” that’s designed to increase women’s heart health awareness and serve as a catalyst for change to improve the lives of women on a global basis. Fashion Week in New York (February 8-16) always kicks off with a fashion show in which the celebrity models wear red in support of the AHA’s initiative. Locally, a luncheon/fashion show is held in May (date/place TBA). While heart disease may be the No. 1 killer of women, knowing your risk factors and acting upon those that you can control will have a positive effect on your heart health. First, it’s vital that you know your numbers, i.e., blood pressure, cholesterol, blood sugar and Body Mass Index (BMI).